Urge the central and local Peruvian government to stop the inhumane act of tying a condor to the back of a bull for bullfighting. 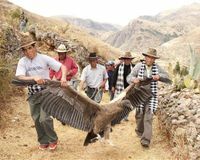 Although the condor is revered in this area of the Andes, and the festival is part of a 'celebration'...the bird is forced to endure harrassment before the fight as drunken festival goers attempt to pluck the bird's feathers....and it's wings and legs are easily broken as the bird tries to free itself from the bull. If it mangages to escape, it likely faces death in the wild from it's injuries. The Andean condor is an endangered species. Threats to its survival should be based in it's home range. Please urge the Peruvian government to make this portion of the festival illegal and find an alternative and humane way to pay homage to the condor. Read more here and see a video.